Urea Agar was developed by Christensen in 1946 for the differentiation of enteric bacilli. The urease test is used to determine the ability of an organism to split urea, through the production of the enzyme urease. Urea is the product of decarboxylation of amino acids. Hydrolysis of urea produces ammonia and CO2. The formation of ammonia alkalinizes the medium, and the pH shift is detected by the color change of phenol red from light orange at pH 6.8 to magenta (pink) at pH 8.1. Rapid urease-positive organisms turn the entire medium pink within 24 hours. Weakly positive organisms may take several days, and negative organisms produce no color change or yellow as a result of acid production. The rapid urease test (RUT) is a popular diagnostic test for diagnosis of Helicobacter pylori. It is a rapid, cheap and simple test that detects the presence of urease in or on the gastric mucosa. It is also known as the CLO test (Campylobacter-like organism test). This test uses a procedure called gastric endoscopy and biopsy to collect stomach lining cells. The test is performed at the time of gastroscopy. A biopsy of mucosa is taken from the antrum of the stomach, and is placed into a medium containing urea and an indicator such as phenol red. 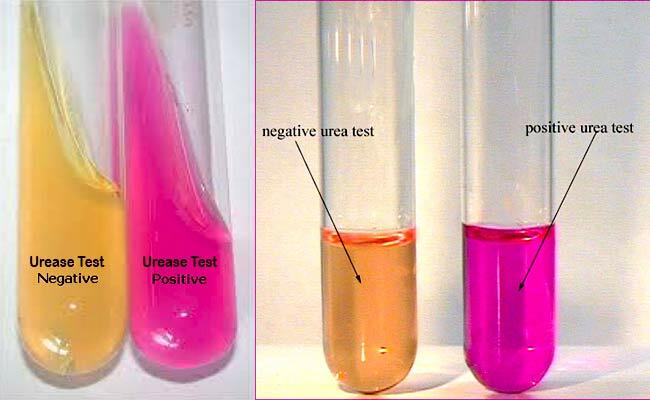 The urease produced by H. pylori hydrolyzes urea to ammonia, which raises the pH of the medium, and changes the color of the specimen from yellow (NEGATIVE) to red (POSITIVE). The test can also be used to provide an informal assessment of the accuracy of the histopathology result and discrepancies should prompt a review of the histopathology and discussions with the pathologist. Urea breath test is a common non-invasive test to detect Helicobacter pylori also based on urease activity. This is highly sensitive and specific test. 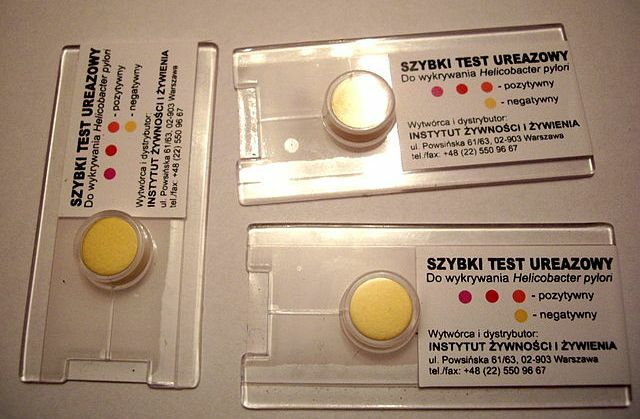 Patient ingests radioactively labeled Urea (either radioactive carbon-14 or non-radioactive carbon-13). If infection is present, the urease produced by Helicobacter pylori hydrolyzes the urea to form ammonia and labeled bicarbonate that is exhaled as CO2. The labeled CO2 is detected either by a scintillation counter (Carbon-14) and a isotope ratio mass spectrometry or by mass correlation spectrometry (Carbon-13). This test is used to differentiate organisms based on their ability to hydrolyze urea with the enzyme urease. This test can be used as part of the identiﬁcation of several genera and species of Enterobacteriaceae, including Proteus, Klebsiella, and some Yersinia and Citrobacter species, as well as some Corynebacterium species. It is also useful to identify Cryptococcus spp., Brucella, Helicobacter pylori, and many other bacteria that produce the urease enzyme. Directly, this test is performed on gastric biopsy samples to detect the presence of H. pylori. Final pH 6.7 +/- 0.2 at 25 degrees C.
Dissolve the ingredients in 100 ml of distilled water and filter sterilize (0.45-mm pore size). Suspend the agar in 900 ml of distilled water, boil to dissolve completely. Autoclave at 121 degree C and 15 psi for 15 minutes. Cool the agar to 50 to 55 degree C.
Aseptically add 100 ml of filter-sterilized urea base to the cooled agar solution and mix thoroughly. Distribute 4 to 5 ml per sterile tube (13 x 100 mm) and slant the tubes during cooling until solidified. Streak the surface of a urea agar slant with a portion of a well-isolated colony or inoculate slant with 1 to 2 drops from an overnight brain-heart infusion broth culture. Leave the cap on loosely and incubate the tube at 35°-37°C in ambient air for 48 hours to 7 days. Examine for the development of a pink color for as long as 7 days. Positive Reaction: Development of an intense magenta to bright pink color in 15 min to 24 h.
Examples: Proteus spp, Cryptococcus spp, Corynebacterium spp, Helicobacter pylori, Yersinia spp, Brucella spp, etc. Negative Reaction: No color change. Examples: Escherichia, Shigella, Salmonella, etc. Some organisms rapidly split urea (Brucella and H. pylori), while others react slowly. To facilitate growth and the urea hydrolysis reaction, do not use inoculum from a broth suspension. After prolonged incubation times a false-positive alkaline reaction may be seen. To rule out this occurrence, check the test with a control (an uninoculated tube of Urea Agar) along with the inoculated tube during prolonged incubation. Do not heat the Urea Agar Slants, as urea decomposes very readily when heated. To detect Proteus species, the Urea Agar, Slants must be examined within 6 hours of inoculation for a reaction. Failure to incubate this medium with loose caps may cause erroneous results to occur. Urea is light sensitive and can undergo autohydrolysis. Store at 2 to 8C in the dark. Bermejo F, et al. : Rapid urease test utility for Helicobacter pylori infection diagnosis in gastric ulcer disease.